Bringing safe water to the indigenous Aeta village, school, and health center will save lives! 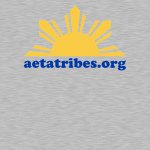 Buying a t-shirt will help provide the essential resources for the indigenous Aeta Tribe of the Philippines. Your generous support will fund a sustainable water project needed in the Nabuklod village, it will allow the indigenous Aeta people to create a new economy without undermining the integrity and stability of the natural forest systems. 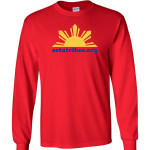 Orders will ship within 10 business days of this fundraiser ending on 12/21. 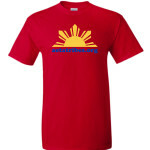 for 100% of the proceeds will build a water system to support a village, health center, and school. Our vision is derived from the concept of sustainable development. It aims to re-build the forest and replace resources that are natural or human made in equal or greater value without degrading or endangering the natural forest system. Our aim shifts the focus to the social and economic development while protecting the environment for future generations. Your purchase today will be invested in a sustainable water project that will bring safe water into the village of Nabuklod, Floridablanca, Pampanga Province. This water will provide the very basic necessities for the survival of the indigenous Aeta tribes living in the village including a health center and a school. The Aeta face many health problems after Mount Pinatubo erupted in 1991 by blanketing the entire forest with volcanic ash including the major streams, rivers, and lakes. This has forced the indigenous Aeta people to spend most of their time searching for the nearest surface water most of which are filled with algae and bugs. Sometimes, they must go down 100 to 500 meters below adjacent cliffs. The women, especially mothers, are commonly the ones who fetch water for their families. In this intensive, daily process should the mother slip or be injured, in going down the cliffside, the whole family suffers, especially the babies and children. We recently found a spring water that is 320 meters below the Nabuklod village. This much needed project will connect the clean water source at the base of the cliffs to the Aeta village atop the cliffs. This will prevent mothers from having to scale the cliffside to retrieve water for their families. The water system will supply water to the Nabuklod village as well as to the nearby school and a health clinic that will preserve their culture and most importantly, approximately 8,000 Aeta lives will be positively affected. Share Why You Support Bringing safe water to the indigenous Aeta village, school, and health center will save lives! The Aeta tribes are the first inhabitants of the Philippines and the true Aeta, who are not part of interracial marriages and who live in the forest, their number are far less than three percent of the total Philippines population of 101 million people. It is the holiday season. That time of sharing and giving.